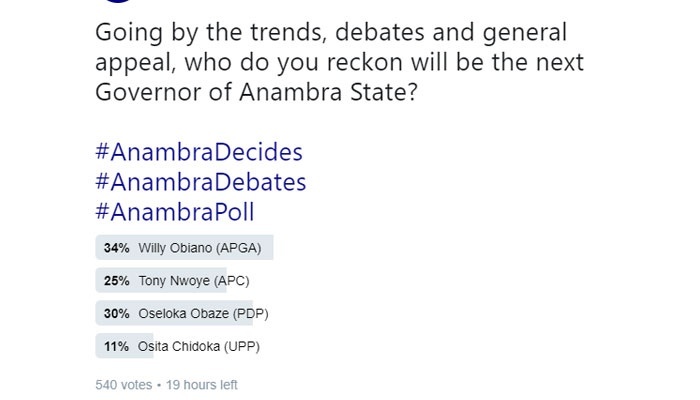 A pre-election poll organised on social network shows the incumbent governor, Mr Willie Obiano, leads as the preferred candidate in the Anambra State governorship election. The Anambra governorship election is just hours away. Political activities have climaxed, as parties strategise to outplay each other in the race to the government house. A total of 37 political parties are taking part in the election, but four of them are top contenders - the All Progressives Congress (APC), All Progressive Grand Alliance (APGA), the Peoples Democratic Party (PDP) and the United Progressive Party (UPP). There are chances that the number will further be cut down to three, as unconfirmed reports claim one of the top contenders has opted for horse trading. The incumbent, Willy Obiano is of APGA, Tony Nwoye APC, Oseloka Obaze PDP and Osita Chidoka is vying for the governorship position under the UPP. While the candidates look hopeful of winning the election, Bounce News conducted a poll that looked at the chances of each of the four top contestants winning the election. A total of 567 persons voted in the pre-election poll on Social network, Twitter. After poll's results were collated on Friday, about 15 hours to the election, the candidate of the APC, Nwoye, polled 25% of the vote with 142 persons tipping him to win the election. Willie Obiano of APGA got 187 of the votes, gathering 33% of the total votes cast and making him winner of the poll. The candidate of the PDP, Mr Obaze got 30% of the votes with 170 persons tipping him to win the election. Osita Chidoka, whom many have described as an intelligent man judging by a debate organised by Channels Television on Sunday polled 12% of the votes which pans out to be 68 votes. Being eloquent has nothing to do with the decision of the people and this could be related to the fact that several promises by eloquent politicians in the past have not been kept. The polls revealed that the incumbent governor has a chance of winning the election, but a twist had come into the election even though it has not been confirmed. Also Read: Could PDP, UPP Be Joining Forces To Tackle Obiano, Nwoye? There are reports that the incumbent Governor has gained the support of 13 of the parties in the contest while Chidoka is said to have merged forces with the Peoples Democratic Party. Could Chidoka have seen the handwriting on the wall and decided to make the move prior to the election? The answer to this question will be provided in coming days, as the electoral body, the Independent National Electoral Commission reels out the results of the election that has been tagged the Ultimate Battle. APGA has been in power in the State since 2006, but two of the strong members of the political party had defected to the opposition in the state prior to the election. A former governor of the State, Mr Peter Obi had moved to the PDP before the son of late Biafra War lord, Odumegwu Ojukwu, Emeka Ojukwu Jr, defected to the APC few days ago. The PDP candidate appears to be a major competition that the incumbent Governor will need to beat in the race. Former President Goodluck Jonathan and other top leaders of the PDP are currently in Anambra State, pushing for their candidate. On Saturday, residents of Anambra will come out to vote, but a group which has been proscribed, the Indigenous People of Biafra, has asked the residents to boycott the election, as a support for their agitation for the independence of the south-east. Nigerians are looking forward to this election, as it holds a lot for the nation.